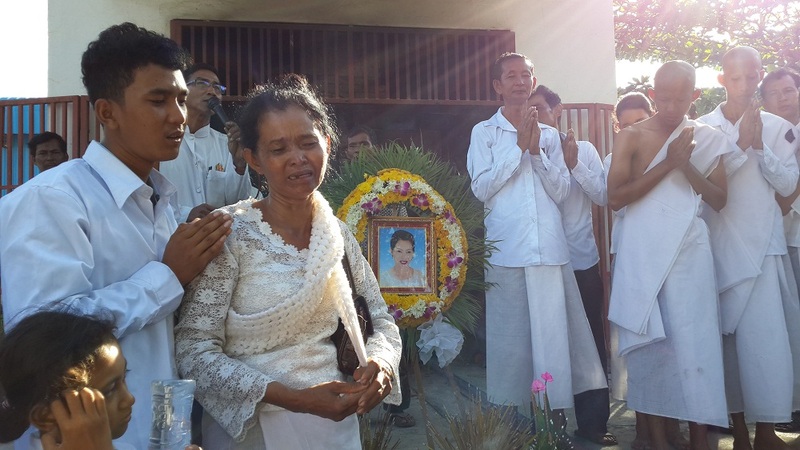 Eng Sokhum's family members cry as her body is cremated at a ceremony in Phnom Penh, Nov. 15, 2013. Cambodian police on Friday denied responsibility for the fatal shooting of a 49-year-old rice vendor in clashes with striking workers, contradicting accounts by rights groups which have called for an independent probe into the violence. National Police Commission Spokesman Kiet Chantharith told RFA’s Khmer Service that police are investigating the possibility of a “third party” behind the killing of Eng Sokhum in the shootings Tuesday that also wounded some 10 others. Local rights groups have continuously said that police had fired pistols and AK-47s to put down the clashes with workers from the SL Garment Factory in Phnom Penh’s Meanchey district, citing video showing officers firing pistols repeatedly while facing toward civilians. Any probe into the clashes, which came amid one of the most violent crackdowns on labor unrest in the country in years, should be conducted by an independent committee, rights group Licadho said Friday. Meanwhile, authorities have ordered the Singapore-owned factory, which supplies clothing to global retailers, to comply with instructions to rehire 19 union leaders sacked in the labor dispute, threatening legal action if the company does not reinstate them. Authorities said 47 police officers were injured in the clashes, which also saw a number of police vehicles torched. More than 40 protesters, including monks, have been arrested, according to rights groups. The violence broke out as some 100 police blocked around 600 protesters trying to march from the factory to the home of Prime Minister Hun Sen to air grievances over low pay and poor working conditions following three months of strikes at the facility. “We don’t know where the bullet for the victim, who was shot outside our operation area, was coming from,” he told RFA’s Khmer Service. Licadho senior investigator Am Sam Ath called on police to explain how the shooting could have occurred without police, who were carrying out the crackdown, being aware of it. “How is it that ‘a third party’ shot so many people while hundreds of police officers were at the scene and the police didn’t see the third party?” he said, calling for an investigation by an independent committee. Eng Sokhum’s family has demanded an investigation into her shooting and punishment for those responsible, saying she was an innocent victim of the clashes. “She didn’t participate in the demonstration. She was selling rice,” her husband Nget Vong said during her cremation on Friday. Video of the clashes has been circulated widely among social media users in Cambodia. The Ministry of Labor has mediated talks between union workers and SL Garment Factory management since the clashes. Earlier this week, authorities ordered the factory, which supplies retailers Gap and H&M, to reemploy 19 union leaders who had been fired during the long-running labor dispute. But the company has refused on the grounds they had “incited” others to go on strike and demonstrate, according to SL Production Chief Y. Chansorn. Authorities warned the company Friday that it would face legal action if it refused to reinstate the workers. “If the factory refuses to comply with the order, it will face the courts,” said the statement, which also required security to be reinforced at the facility. Authorities have summoned representatives from the workers and the management for talks since the orders were issued, but no resolution has been reached yet, Cambodian Garment Workers Union CGWU deputy president Kong Atith said. Simply remove the bullet in the body of Ms. Eng Sokhom to know with what weapon killed the victim. Dear HunViet's shepherd, of course you don't bite the hand who is giving food to you, until you are being eaten then you known who is really like to eat the dog meat! There is no way in the world to find a killer in this case. If you are asking a killer to investigate and find the killer what do you expect the answer going to be? Of course they are not responsible. But in reality they are the one with the guns therefore they are the one who committed the crime. The evidences are all over media outlets including social medias. When Hun Sen made a promise, after his party robbed the election, that his government will change well this is how they change by beating and killing innocent people. They have changed themselves into mad dogs. Hun Sen has reached the lowest point in his political correa.